This article is about the base map. For the Center DLC map, see The Center. For the Scorched Earth DLC map, see Scorched Earth. For the Ragnarok DLC map, see Ragnarok. For the Aberration DLC map, see Aberration. For the Extinction DLC map, see Extinction. The Island is the first known ARK. 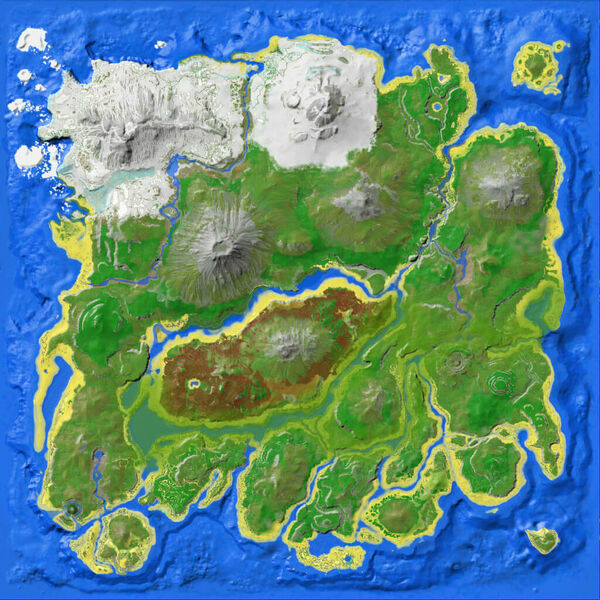 The Island is a map included with the base game of ARK: Survival Evolved. It is the first known ARK. The Island consists of multiple climatic and geological regions. There are five larger mountains in the north and plains in the south. Three large Obelisks form a triangle on the Island. The Island is an island surrounded by water. Resources become more common as one travels farther inland, but so do the dangers. Some areas are higher in temperature while others are lower which can be life threatening. On The Island there are two types of Weather, Rain and Fog. When it rains, you will gain Water and be able to fill your Waterskin, Water Jar, or Canteen. When fog rolls in, it is hard to see very far. As The Island is part of the story of the ARKs, Explorer Notes can be found across the map. These Explorer Notes document the ARK lore. For more in-depth information, see Explorer Notes. In addition to the Explorer Notes, Dossiers can also be found on The Island, written by Helena Walker to document the research of the The Island's creatures. For more in-depth information, see Dossiers. On Xbox since v757: If you would like to play The Center map without advancing through The Island, launch the Island and then open the command menu. Type in cheat playercommand Ascend2. Once finished you'll be able to load The Center as normal. On PS4 since v510: If you would like to play The Center map without advancing through The Island ascension, launch the Island and then open the command menu. Type in cheat playercommand Ascend1. Once finished you'll be able to load The Center as normal. HiRes Map UI Grid texture. An Arabic version of the can be found here. This page was last edited on 9 April 2019, at 15:11.